Décryptage by Sandrine Merle, an author, a media, a partner – the french jewelry post. On December 1 and 2, fashion antiques dealer Catherine Lecomte is bringing together fifteen or so colleagues at the Bristol Hotel. 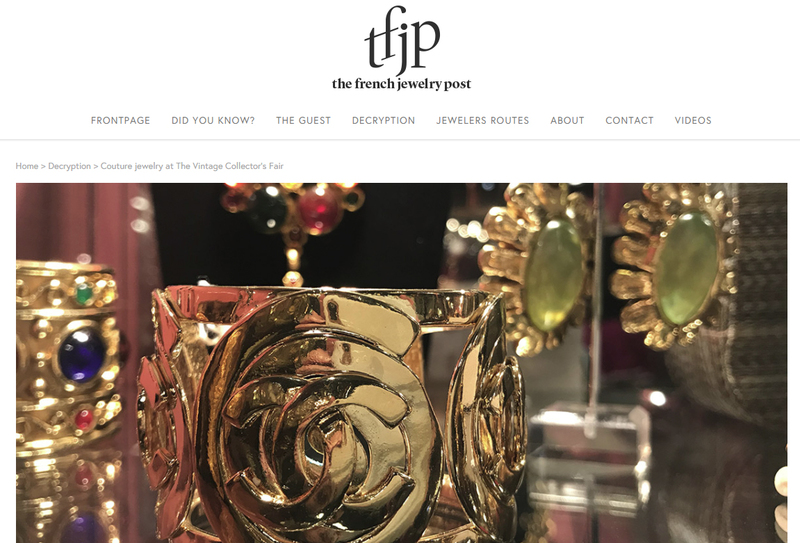 “High-end vintage” comes in the form of clothing, watches, bags, and couture jewelry – now presented to you by the french jewelry post. Couture jewelry is a term covering the exuberant, oversized, colorful necklaces, bracelets and rings “invented” in ther 1920s by couturiers like Schiaparelli, Chanel and Poiret. These fancy (read “fake”) pieces were made of ordinary materials like brass, plastic, glass and fabric, which paved the way to the wildest fantasies for a reasonable price. “Their value was chiefly ornamental, and their purpose was to set off a garment’s style,” says dealer Catherine Lecomte, the founder of the Vintage Collector’s Fair.